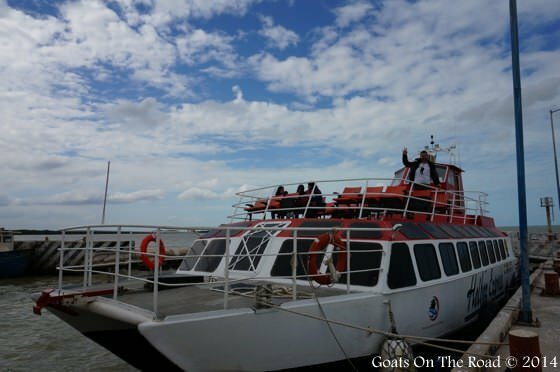 When our ferry docked on the low-key, laid back island of Holbox, it was almost like we were greeted with a tranquilizer gun. We felt the relaxed vibe wash over us and the entire pace of our travels slow as we lazily sauntered off of the 100 seater boat. 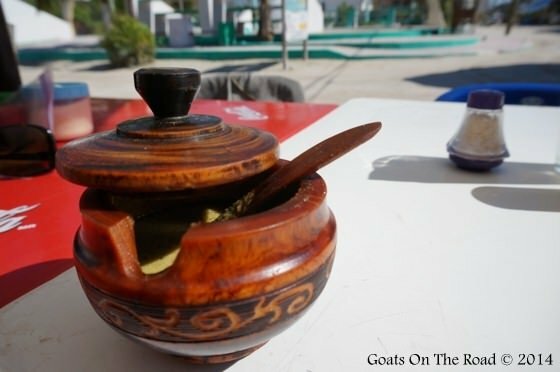 We soon realized why this is one of the best places to visit in Mexico. There are no roads here, just dirt tracks which connect the seemingly endless number of beaches and restaurants that pepper the island’s coastline. There are no supermarkets, no Wal-Marts, no McDonald’s. Just a healthy dose of authentic Mexican restaurants, fruit stands and mini-marts. This is the relaxing vibe that the Caribbean is known for and before we even reached our hostel, we could feel the contagious calm soak into our pale, sun-shy skin. After 5 months of travelling in Central Asia, with visa worries, border control and invitation letters, this is the kind of relaxation we had been looking for. We didn’t even have to walk 10 steps to realize that we were going to want to stay here for a while. The sun peered through the towering coco-palms above us, as we followed the sandy paths to our hostel. We checked in to the funky and friendly Ida y Vuelta Hostel and immediately headed for the beach. Guide books compare the waters here to those of Cancun, stating that the beaches along the Mayan Riviera are more beautiful. 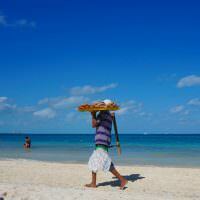 During our stay here, the crystal clear waters and powdery white sand looked just as pristine as those in Cancun. Sometimes in the evenings when the Gulf Sea floods in and mixes with the Caribbean waters, the clarity suffers only slightly, but offers a new hue to the translucent azure beauty. Floating in the incredible water is definitely one of the top things to do in Mexico. The beaches here are absolutely stunning and we’ve enjoyed lazing in the sun and watching the days go by. 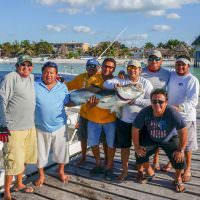 We’ve feasted on a mixture of home-cooked Mexican food and Yucatan style seafood. The hot spices here are so mouth-watering that a burnt tongue is worth the added flavour. 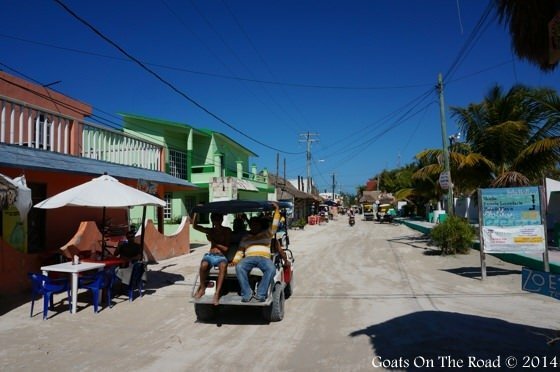 People on Holbox get around by golf cart, that’s right, there are no cars. We considered renting a golf cart for the day but decided against it because A: we want the exercise and B: they’re a bit overpriced at 100 pesos ($8) / hr. The crowd on the island is mixed. There are a lot of uber-budget, hippy type travellers in funky clothes and dread-locks, brushing shoulders with resort goers, laid back locals and sun-drunk expats. One thing is for sure though, everyone is here to relax and have a good time. Local kids are always playing around on the sandy paths and there are enough palm trees to shade the full interior of the island. Soaring above is a wide variety of exotic birds. 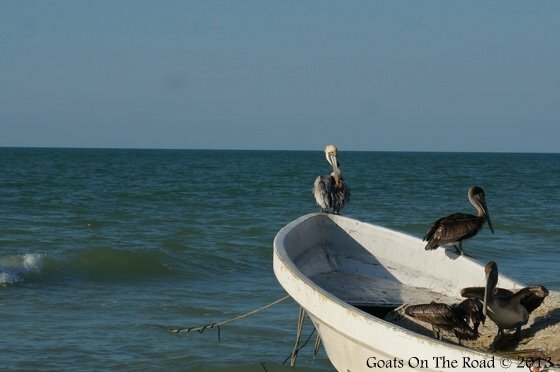 Close to the shore, enormous pelicans patrol the shallow waters searching for fish. From June to September, enormous Whale Sharks congregate just off shore in numbers unheard of elsewhere. 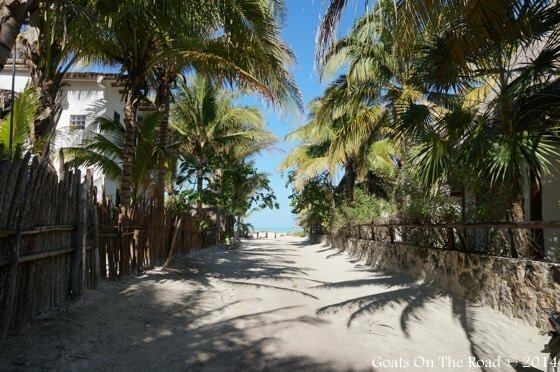 There are almost too many options for food and accommodation, from shoestring to chic, you can find it all here on Holbox. But even though expensive resorts line the coast, there isn’t a resort feel to the place. Even the fanciest hotels on the sand are built with mostly grass thatched roofs and bamboo gazebos so the beaches retain a natural feel. 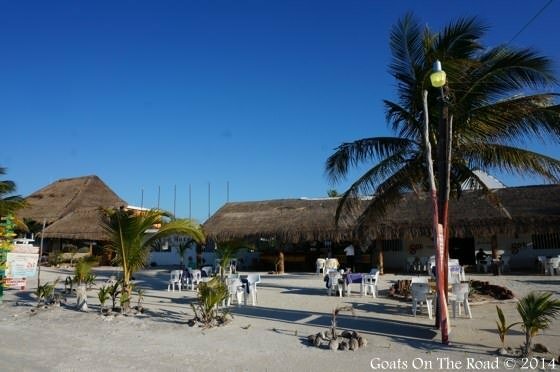 And although most beachside bars and restaurants are out of a backpacker’s budget, there are a few that offer great value for money. We’ve spent only a few nights here so far, but we can already tell that we’ll want to extend our visit. We’ve met some travellers who had planned to come for a week, and just decided to live here. 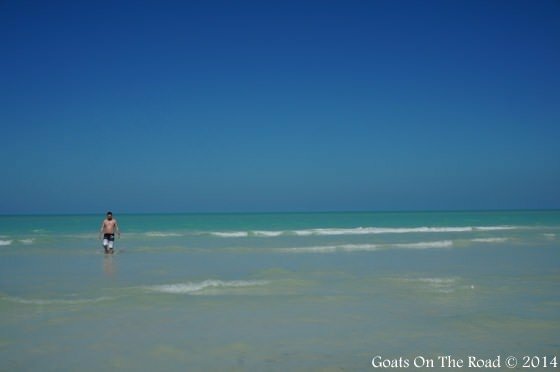 Holbox is one of those places. 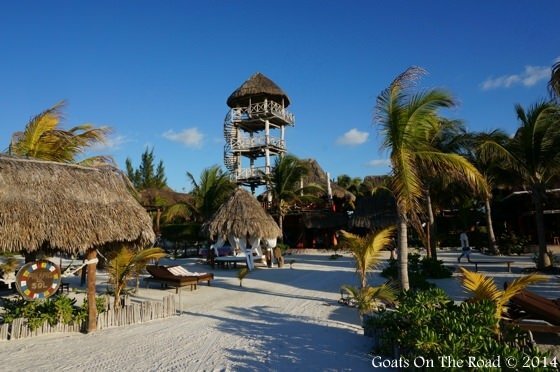 If there ever was an island that encompassed the tranquil laid-back nature which is synonymous with the Caribbean, Isla Holbox is that place. We’ll be writing more about this funky island, but those articles will have to wait because it’s time for another margarita! Stay tuned for more about this incredible island. We all love a place with a great vibe. Have you every been somewhere that you didn’t want to leave? Share with us below. Surviving Food Poisoning: Goodbye Mexico, Hello Guatemala! Great to hear about your first impressions of the island, was just looking into it myself. Would love to hear more about where you are staying and what the accommodation options on the island look like? It’s such a chilled out island, we really enjoyed our week stay there. We stayed at Ida y Vuelta Hostel, which has private bungalows, camping, hammocks or dorms available. It was a great place. There is another hostel on the island as well, but from what I hear, it’s more of a party place. There are also resorts along the water, but they aren’t highrises or anything like that, they’re very funky looking and suit the feel of the island. There’s something foe every budget I think. An interesting article. I had never heard of this island, but now I’ve found it too. Looks like paradise. It was definitely a very quiet, chilled out island with not a whole lot to do, but that’s the point! I’m sooooooo jealous! hahaha In the good sense of the word, of course! It’s nice you can share so many adventures together as a couple, certain destinations are not the solo traveler best spot. 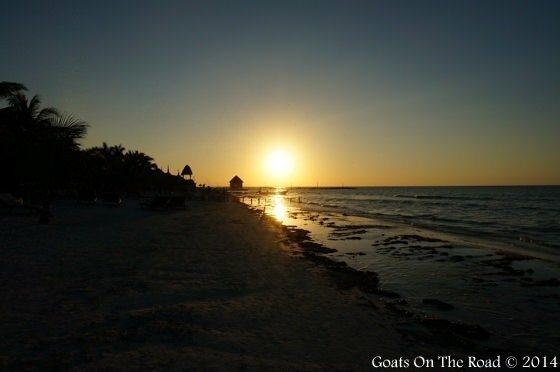 Sometimes there is a “romantic” feel to a place or whatever, but actually, there were a lot of solo backpackers on Holbox. It’s known as being the backpacker island. It definitely wouldn’t matter if you were solo, a couple or a group here. Thanks Tim! For us, it was perfect. For many, they may find it a bit boring. There’s not a whole lot to do, but that’s the point! Enjoy the days relaxing with friends, swimming or wandering around town. Watching the sunset in the evening with a beer on the beach is perfection. 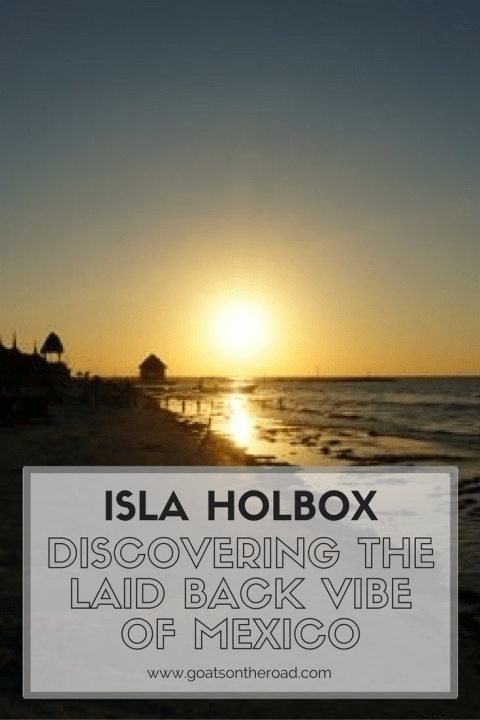 Isla Holbox is one I am sad to say I was not aware of. Sounds like the perfect place to drop off the edge of the earth for awhile when you need to charge your batteries. I’m looking forward to seeing more pictures from there. Looks like quite an idyllic spot to hang up one’s sunhat for a while! Awesome introduction to the island. Can’t wait to get there ourselves in just a few weeks! The water looks beautiful 🙂 I can’t even imagine going as long as you guys did without a visit to the beach haha. I feel like we’ve been chasing tropical destinations for the past couple months now. I know! It’s been waayyyy too long. Which is actually weird for us, we love the beach/island lifestyle! Perfect for some hot beach vacation due to this long freezing winter.